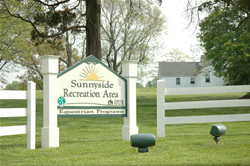 The Sunnyside Recreation Area is the home of the Park System’s Equestrian Division. This division provides fundamental equestrian experiences for people of all abilities, with an emphasis on offering the benefits of therapeutic horseback riding to individuals with physical and cognitive disabilities, helping them to develop to their full potential. The Sunnyside Equestrian Center became a reality after years of dreaming, planning, and vigorous fund-raising. This facility features an 18-stall stable, an outdoor instructional ring, and an 80’ x 200’ indoor instructional arena that enables the Park System to offer year-round lessons. 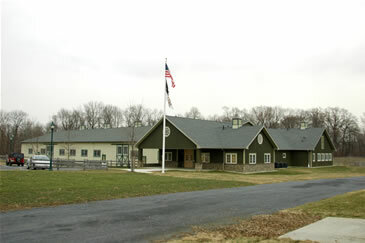 Currently, the center houses 16 horses. These equine heroes are carefully chosen and specially trained for the therapeutic horseback riding program. Many of the horses have been donated. For more information about donating a horse, please call 732-224-1367. Sunnyside Recreation Area features a short paved trail and a short unpaved trail (1.4 miles or trail.) Parking lot for trail is on Sunnyside Road.